NINE teams are battling for SIX spots in the NFC. Only TWO teams have CLINCHED a playoff berth in the NFC, so over the next TWO weeks, there are FOUR spots still up for grabs. In this blog, I will go through all remaining NINE teams in the NFC and their scenarios to get to the playoffs. The AFC Playoff Picture was released yesterday, and can be found right here. The Eagles were able to ESCAPE out of New Jersey with a WIN on Sunday and also CLINCHED a first round bye with that WIN over the rival Giants. This was the first game for the Eagles after the SEASON ENDING injury to their quarterback and MVP candidate, Carson Wentz, and his absence was EVIDENT in the game. Nick Foles took over the quarterback position and STRUGGLED early in the game but ENDED the game GREAT. The Eagles were a Super Bowl FAVORITE with Wentz, that has taken a HIT in his ABSENCE, but they are still a VERY GOOD team. The goal for the Eagles the rest of the season is to SECURE Home Field Advantage and get Foles more confident. Clinching Scenario- The Eagles can CLINCH Home Field Advantage throughout the NFC playoffs with a WIN over the Raiders at HOME on Christmas Night OR a Vikings LOSS to the Packers on the ROAD on Saturday Night. The Eagles might NOT be fully healthy, BUT they are still a team NOBODY wants to play in the playoffs. The Vikings STILL have an opportunity to have Home Field Advantage for the ENTIRETY of the playoffs, as they are hosting the Super Bowl this year, but they need HELP from other teams. They still control their OWN destiny for a first round bye and should be focused on that rather than trying to get Home Field Advantage. The Vikings have a chance to be the first team to have a HOME game for a Super Bowl, if they KEEP WINNING. Clinching Scenarios- The Vikings can CLINCH with a WIN over the Packers AND a Panthers LOSS to the Bucs at HOME. They CANNOT LEAPFROG the Eagles to climb to the ONE seed this week. 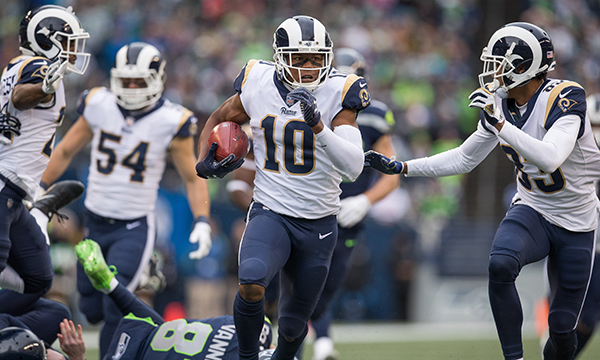 The Rams had the BIGGEST WIN of their season by TROUNCING the Seahawks in Seattle on Sunday. The Rams are now in PRIME position to win their division and MARCH into the Playoffs. There is an outside chance that the Rams can get a first round bye, but a lot of things would need to get MURKY in order for them to get there. Clinching Scenario- The Rams CLINCH the NFC West with a WIN over the Titans on the ROAD OR a Seahawks LOSS to the Cowboys WIN on the ROAD. They CANNOT climb into the TWO seed this week, but they can FALL to the FOUR seed if they LOSE their game and the Saints are able to WIN their game against the Falcons at HOME. The Rams are one of the BEST teams in the NFL, and many consider to be the FAVORITE to get to the Super Bowl, so they are force to be RECKONED with in the playoffs. The Saints BARELY beat the lowly Jets and they DID NOT look like a playoff team in that game. LUCKILY for them, they still control their OWN destiny to the playoffs and can get there this week. It is going to be HARD for the Saints to climb out of the FOUR seed, but IF things get MURKY then anything can happen with the Saints. Clinching Scenario- The Saints CLINCH the NFC South with a WIN over the Falcons AND a Panthers LOSS to the Bucs. The Saints can LEAPFROG the Rams into the THREE seed with a WIN and a Rams LOSS, but they can also drop to the SIX seed if they LOSE the Falcons and the Panthers WIN over the Bucs. The Saints can end up ANYWHERE between the THREE seed and the SIX seed in the NFC, so it would work in their FAVOR, IF they are able to WIN on Sunday. The Panthers REFUSE to LOSE and STILL could end up WINNING the division, but they would need some HELP from other teams in the division. The Panthers main FOCUS next week should be to SECURE a playoff berth and they DO NOT need HELP from anyone for that. Clinching Scenario- The Panthers CLINCH a playoff berth with a WIN over the Bucs. They can also LEAPFROG to the FOUR seed in the NFC with a WIN and a Saints LOSS to the Falcons. The Panthers, like the Saints can end up ANYWHERE between the THREE seed and the SIX seed in the NFC, so they should KEEP WINNING to get the HIGHEST seed that they can in the NFC playoffs. The Falcons can STILL win the NFC South if they WIN their next TWO games, but they can also fall OUT of the playoffs if they LOSE their next TWO games. The Falcons OWN the tiebreaker over ALL teams that are OUT of the playoffs in the NFC, so they cannot fall OUT of the playoffs, with a LOSS this week. Clinching Scenario- The Falcons can CLINCH a playoff berth and CLIMB into the FIVE seed with a WIN over the Saints next week. At WORST the Falcons will be the SIX seed at the END of Week 16, but if they want a HOME game in the playoffs, then they should WIN next week. The Lions were able to BEAT the Bears this week and are still ALIVE for the Playoffs. The Lions CANNOT climb IN to the Playoffs this week, but they can be ELIMINATED from the Playoffs this week, so they should FOCUS on WINNING this week. ELIMINATION Scenario- The Lions will be ELIMINATED from the playoffs with a LOSS to the Bengals on the ROAD OR a WIN by the Falcons over the Saints. The Lions CANNOT afford to LOSE next week if they want to get to the playoffs. The Cowboys and the Seahawks are BUNCHED up together because these TWO teams play each other next week and the LOSER of the game will be ELIMINATED from the playoffs. The Seahawks could have controlled their OWN destiny to the playoffs if they had WON over the Rams, but now they are barely ALIVE for the playoffs. ELIMINATION Scenario- The LOSER of the game between the Cowboys and the Seahawks in Dallas, next week will be ELIMINATED from the playoffs. The WINNER of this game can LEAPFROG the Lions into the SEVEN seed IF the Lions LOSE their game against the Bengals. Both of these teams need things to get MURKY in order for them to get to the playoffs and that can only happen for the team that WINS this game. Those were the playoff scenarios for all NINE remaining teams in the NFC. Gun to my head, the SIX teams that make the playoffs in the NFC are the SIX teams that IN right now, but things would need to get MURKY in order for me to be WRONG. Check back next week to see how the playoff picture is affected by the games over the next SEVEN days.